Unique video of a SnoGo snow blower mounted on a 1957 (Badger) Four Wheel Drive Auto Company, FWD for short. 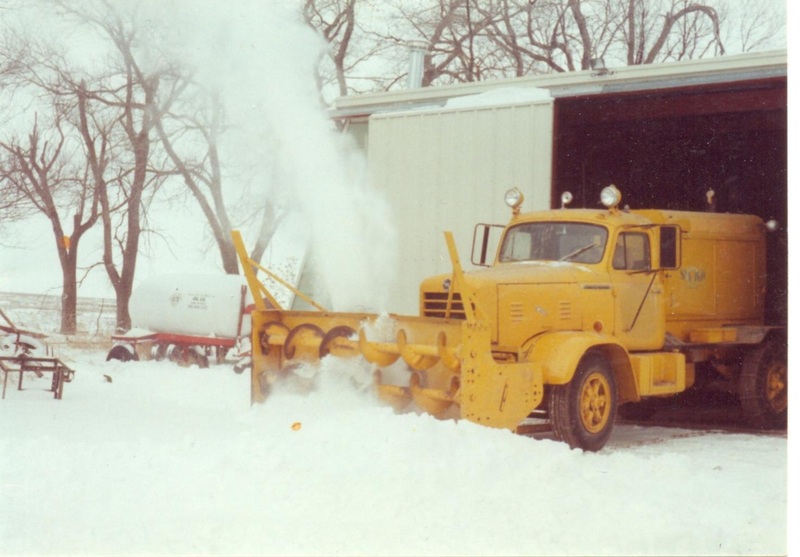 The snow blower is powered by a large displacement 8 cylinder Climax gasoline engine that runs at relatively low RPM (about 1300) and sits on the rear. The blower can chew an 8 foot wide swath aprox. 5 foot tall. Hydraulic rams control the up and down and float feature of the blower. Multiple gear ranges allow for as slow as 1/4 mph speeds with a top speed of about 40 mph. Full time 4 wheel drive ensures maximum traction. The FWD company invented the first successful 4 wheel drive vehicle in 1908. Later the FWD company made mostly chassis cabs with their 4 wheel drive systems for military, fire departments, road construction and other emergency vehicles. The SnoGO company still produces large commercial snow moving equipment designed to be mounted to various vehicles. If you liked this video please leave a comment.